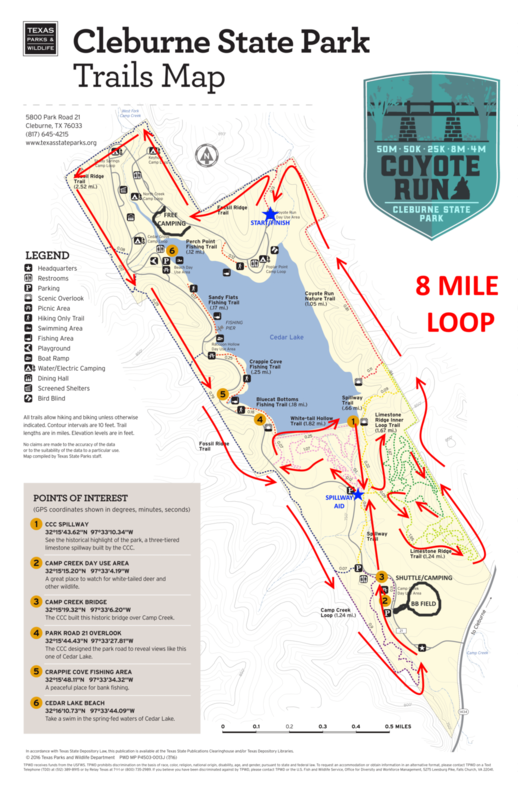 The Coyote course is one of the toughest in Texas packing a 1250' gain per the 8 mile loop. There are 2 aid stations on the course. The map is below. 8.33 mile loop will hit the aid station at mile 4 and 8.33 each loop. All aid stations (2) are FULL AID STATIONS and will be full stocked with Texas Style goodies. There is parking at any open areas in the park and also at the baseball fields just to the left as you come in the gates. The park will be OPEN all night FRIDAY NIGHT for late arrivals. We will run 2 shuttles from the baseball fields just to the right of the parking lot and up to start finish all day saturday. We will allow parking in open spots in the park until it fills up and then we will utilize the ball fields. There are no pacers allowed for the race. Crews are allowed at both aid stations. There will be an area at both locations for you to drop your own bags and pick them up a well. We will have FREE primitive camping at the group area just to the west of the start/finish and also at the baseball fields area. Hotels in the area are in Cleburne and around 15-20 min away. Latitude (degrees, minutes, seconds) N: 32° 15' 08.46"
Longitude (degrees, minutes, seconds) W: 97° 32' 58.63"
We will let you choose your swag but well do 50/50 Blended Shirts with race logo on it.